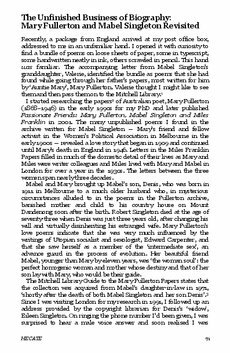 The article presents an informal biography of Australian women poet Mary Fullerton and her friend Mabel Singleton. A letter containing unpublished poems by Fullerton was sent by Mabel Singleton's granddaughter Valerie to the author. Some of these unpublished poems were dedicated by Fullerton to Valerie's father Dennis including "The First Peas of Summer." Mary and Mabel were friends and fellow activists in the Women's Political Association in Melbourne in the 1900s. They were living in the same house, raising together Mabel's son Dennis.